I Finished the Last Block! What a fantastic way to end this week! I finished the LAST block for my BOM quilt!! I almost didn’t make it. Finding time to sew this week required me to sacrifice some time with my husband, but I really wanted to get them done so that I could finally start assembling them next week! Thankfully my husband is very understanding and wants me to spend time doing things that I enjoy, even if those things sometimes take me away from him. The two large blocks I worked on each had their own challenges. Neither one is perfect, but I am pretty proud of how well they turned out because they were not easy to do. 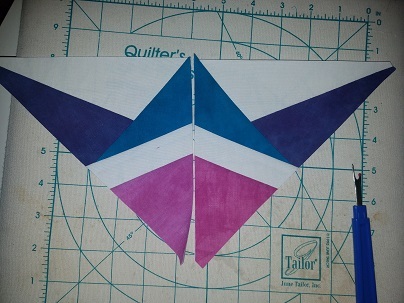 The first block utilized paper piecing for the middle section but normal piecing for the edges. It turned out pretty well because I used my Ideal Seam Guide when I made the flying geese which helped make sure they were all the same size. The only issue was with where the rows line up on one section. I don’t know why it’s off because my measurements were exact, but that’s okay. I think I’m the only one who will notice. 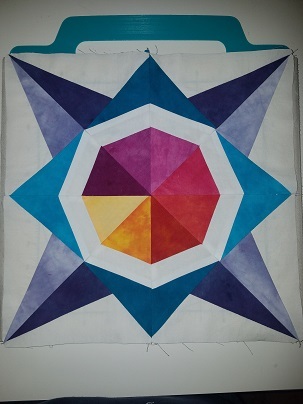 The second block is the “Grand Finale” block that uses different colors from previous month’s blocks. I’m not gonna lie, I was really nervous about this block. First, I didn’t want to get the colors wrong. Not only did I have to dig out some fabric I haven’t touched in ten months, but I also had to make sure I assembled it in the correct order so that it looked pleasing to the eye. There were many opportunities for error here, but thankfully I only made one that was bad enough to require fixing. 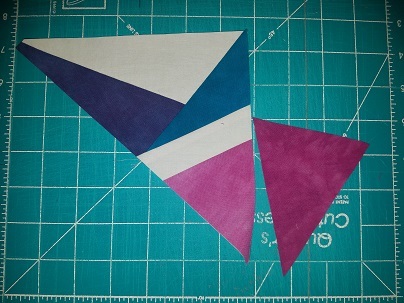 This block was entirely paper pieced and when I had finished sewing all of the individual sections I laid them all out to see how they looked together. Unfortunately, I realized that my fuchsia and my pink end sections were way too close in color. It was bad enough for me to double check the pattern and I realized I had cut the wrong shade of fuchsia. 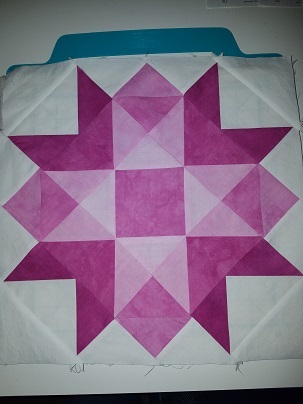 The center of the block is supposed to lighten and darken with the different colors. The whole center was thrown off with these two being practically the same color. I ended up cutting a new piece of fuschia and replacing the lighter shade with it. It was a bit of a process because I use smaller stitches when I paper piece, but it was worth the effort. Here is the new shade piece before I attached it so you can see how much lighter the wrong piece was. The final product was worth the effort to switch them out. I knew I’d be so much happier with the final block if I took the time to fix the mistake. My only issue with this block is the center points. I tried twice to line it up perfectly but I couldn’t get it. The first attempt had half of the colors coming in to perfectly pointed tips but the other half were way off. Glaringly so. I wish I had thought to take a picture of it, but I did not. The second attempt has left neither side perfect, but the distance between them isn’t obvious anymore so I’ll take it. Isn’t it stunning? I love all of the colors that it utilizes from the previous blocks. It will be dead center in the finished quilt so it really helps tie all of the colors together. The only shade it’s missing is green, but I think the green would have looked weird so it’s okay that it isn’t being used. The only thing I have left is to assemble this bad boy. I’m so excited that I spent some time this morning laying out all of the pieces. 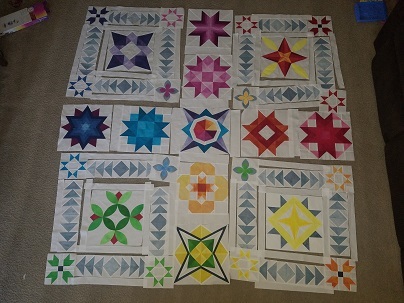 This is a rough idea of what the quilt will look like once I sew it all together. It’s missing a few white borders but my cat started to attack all of the pieces so I had to scoop them up before it was complete to avoid puncture marks in all of the pieces. I would have cried if he had gotten to them. As it is my hands are full of puncture marks, but it was a small sacrifice to rescue the blocks. I’ve invested a year into this project and I do not want to see that ruined by a moving fluff ball. Now that I’ve seen it all laid out I’m getting nervous for the final assembly. I stress about making sure things are lined up properly, but as long as everything measures the way they’re supposed to it should come together without too many problems. I have noticed a difference in the quality of my stitching from the first few blocks to the final block. I’ve definitely improved over these twelve months. I’m so grateful for everything I’ve learned and the confidence I’ve gained. I can’t wait to tackle more projects in the future!